New Orleans Seminary President Chuck Kelley speaks about the new fund to assist deaf students as Janie Powell translates into sign language. The widow of a deaf minister has provided the initial gift to help break down one of the major barriers for deaf students — the added cost of hiring an interpreter. NEW ORLEANS (BP) — Stephanie Johnson knows the challenges facing a potential seminary student who is deaf: She saw her husband’s perseverance in following God’s call. Ultimately Daniel Johnson overcame the challenges, attended New Orleans Baptist Theological Seminary and earned a master of divinity degree. Daniel went on to serve as a minister to the deaf and a North American Mission Board church planting strategist until his death in January 2011 after a lengthy battle with cancer. Now Stephanie Johnson has given an initial $40,000 gift to establish a new fund at NOBTS — the Accessible Theological Education for the Deaf Fund — to help deaf students receive training for missions and ministry. Johnson is quick to point out that the fund will not be named after Daniel because he wouldn’t want that kind of attention. 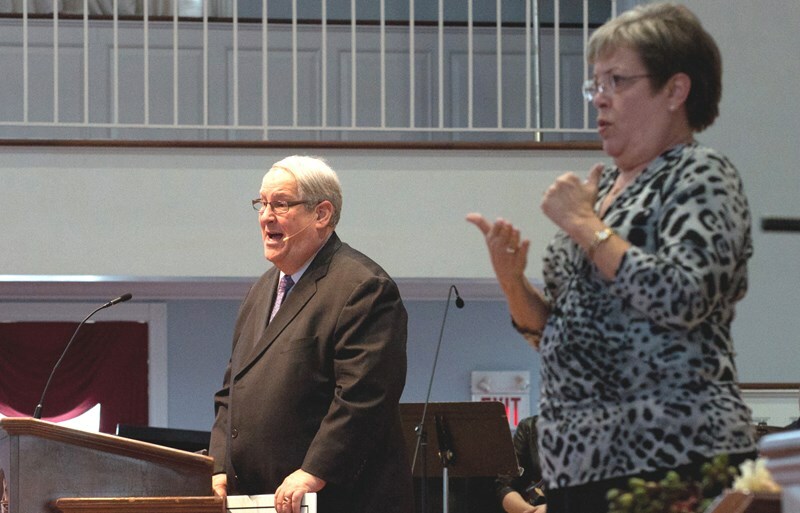 Her hope is the deaf Southern Baptists will embrace the fund and join in supporting it to help break down one of the major barriers for deaf students — the added cost of hiring an interpreter. That was the obstacle that nearly ended Daniel’s quest for ministry training. Daniel was born on the mission field to SBC missionaries serving in Chile. He became deaf at age 8, and his parents left the mission field due to his deafness. Daniel never lost his mission zeal and always had a passion to see the deaf at home and around the world come to Christ. He knew God was calling him to ministry and calling him to seek theological training. When Daniel first applied to one of the Southern Baptist seminaries, the school affirmed his call and agreed to accept him but did not have funding to help with an interpreter. The school suggested that Stephanie accompany her husband to class to take notes and interpret. But she also needed to work to pay for tuition and living costs. Daniel decided to try another school before giving up on seminary. This time he applied to NOBTS and response was identical: The school affirmed Daniel’s call and welcomed him as a student but he would have to provide his own interpreter. This time, thanks to funding from the Louisiana Baptist Convention and several NOBTS students who knew sign language, Daniel enrolled at NOBTS in 1982 and completed the master of divinity degree in 1985. Johnson presented the fund’s initial gift to NOBTS President Chuck Kelley during the seminary’s Jan. 17 chapel service. Kelley, who taught Daniel in an evangelism course at NOBTS, remembered him as a passionate minister of the Gospel and a dedicated student. To honor and support Johnson’s efforts, a small contingency from the Southern Baptist deaf community attended the ceremony. Members of Canal Blvd Baptist Deaf Church in New Orleans, First Baptist Deaf Church in Baton Rouge, La., and Woodhaven Baptist Deaf Church in Houston, Texas, were there as well as David Gregory*, International Mission Board Deaf Affinity Group missionary to Ecuador, and Jim Booth, NOBTS alumni and retired minister/missionary to the deaf. Janie Powell and NOBTS student Angela Scruggs served as interpreters during the chapel. Johnson said the lack of funding for interpretive services for deaf students, especially those following God’s call to international missions, burdened Daniel until his death. The IMB requires 20 hours of seminary training for its career missionaries, so the increased financial burden of interpreters can be a hindrance for some deaf students. Johnson is hopeful that her gift and similar gifts from others will help alleviate the extra costs to deaf students and mobilize more missionaries to the deaf people of the world. The International Mission Board affinity groups dedicated to reaching deaf peoples estimates that there are as many as 28.9 million deaf people living outside the United States. The IMB currently has about 50 missionaries serving among the deaf. Gary D. Myers is director of public relations at New Orleans Baptist Theological Seminary. For more information about the Accessible Theological Education for the Deaf Fund, contact NOBTS at 1-504- 282-4455, ext. 3252.